From head to toe, Lacoste's spring line is full of color. It's been a long rocky journey, but true to its creator's fighting form, the croc -- Lacoste, that is -- arrives in Honolulu with the grand opening of its Ala Moana Center boutique today. On the floor will be the colorful polos the brand is known for, plus button-down pullovers, sweaters, Bermudas and neo-preppie chic as interpreted by creative director Christophe Lemaire, who has infused the brand with energy and excitement since his appointment in 2001. The croc was in need of rousing due to competition from hipper athletic and skate brands, and quickly traded its sporty air for a more fashionable vibe. One thing hasn't changed, though. You'll still recognize the brand by its iconic little green crocodile, the nickname for founder René Lacoste, a tennis superstar of the 1920s recognized by American sportswriters for his tenacity and ability to "fight like an alligator." At home in France, "alligator" translated to "crocodile" and he took the name to heart, embellishing his tennis blazers with an embroidered crocodile designed by his friend Robert George. Are you man enough for color? 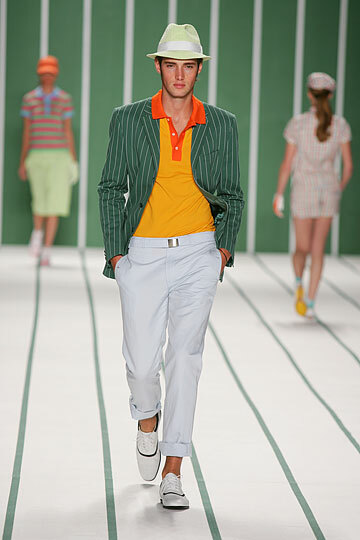 Lacoste offers plenty for spring, from the lime fedora to the mandarin orange polo to the blue-green pin-striped jacket. The croc would later appear on the original polo shirt he designed in 1933 as a way to stay cool on the courts. The shirt had short sleeves, replacing the starched long-sleeved shirts worn at the time, and was made of a breathable, light-knit jersey petit piqué that allowed freedom of movement. The shirts were a hit in the United States from the 1950s through '60s as the perfect preppie statement, but after another 1980s preppie fashion wave, the brand sputtered. New consumers had little interest in the ubiquitous, uniform and (more importantly) unsexy "alligator shirts." Enter Robert Siegel, who in 2002 as chairman and CEO for Lacoste USA was charged with resuscitating the croc. He'd already launched the successful Dockers brand for Levi Strauss in 1986, and with Lemaire focused on catching the eye of fashion-conscious women. Timing was right as Lacoste's return coincided with the vintage preppie look hitting fashion runways and the rise in retro street sneaks and track suits. This season, Lemaire developed a clean, crisp collection he calls "Preppy Pop." Paying homage to the brand's tennis heritage, he shows the three fundamental colors of Lacoste -- green, red and navy -- in sharp jackets, blousons and shirting. Skater girls get their day too, with short shorts, tank tops, helmet caps and knee pads in primary colors that can be worn effortlessly from days on the courts to nights at the clubs, and I don't mean country clubs. 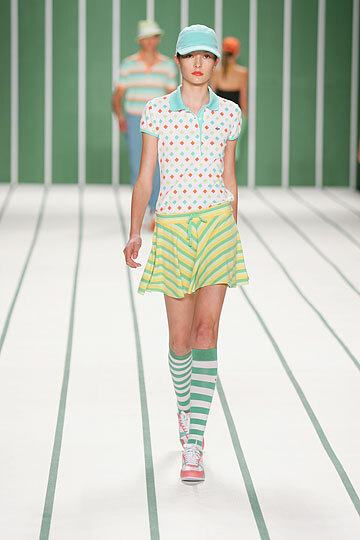 The garments still reflect Lacoste quality and comfort, but instead of reading "tennis nerd," the new designs translate internationally as "cheeky college-coed meets Harajuku girl." In other words, Lacoste is no longer one-style-fits-all, and certainly no longer your mom's or dad's croc. For more information call the boutique at 941-3001.